A selection of three rare Tiffany Studios floor and table lamps from a private collection out of Houston, Texas, plus the contents of the Pawtucket, Rhode Island Preservation Society Joseph Spaulding House are just a taste of what’s in Bruneau & Co. Auctioneers’ upcoming Estate Antiques & Fine Art Auction on Saturday, September 22nd. The auction will be held online and in Bruneau & Co.’s gallery, located at 63 Fourth Avenue in Cranston, Rhode Island, beginning promptly at 10 am Eastern time. More than 450 lots will come up for bid. “You name it, this sale has it,” said Travis Landry, a Bruneau & Co. specialist and auctioneer. 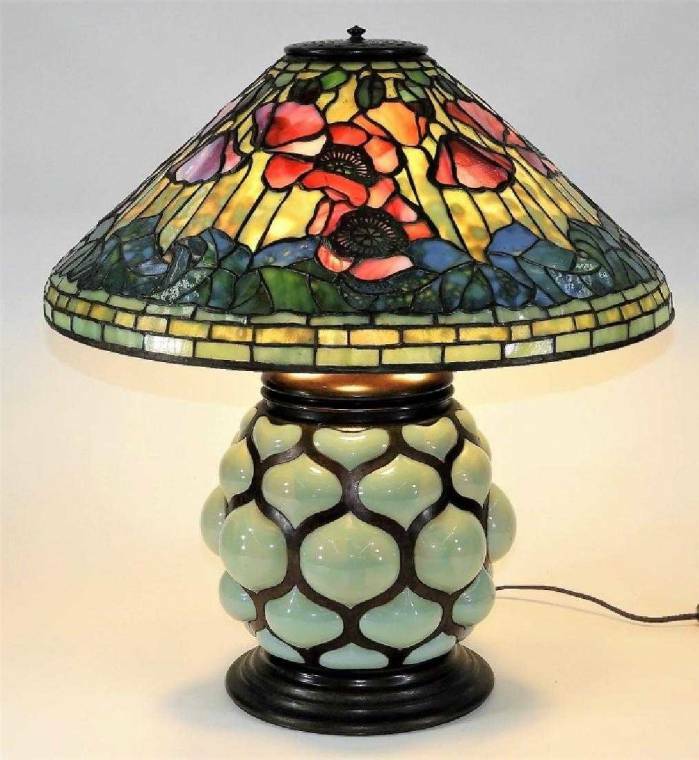 The lamps include a Tiffany Studios (N.Y.) allover Dogwood floor lamp, 63 ½ inches tall with a 22-inch diameter shade boasting variegated iridescent white Favrile glass petals; and a Tiffany blown glass table lamp with a 20-inch diameter Poppy shade of multi-colored Favrile glass. Both are circa 1910. The auction will open with a 1929 Ford Model A closed cab pick-up truck and a 1922 Ford Model T wood body depot hack truck. The next portion of the catalog will feature over 143 lots of fine art and works on paper. That will be followed by330 eclectic lots of antiques, Asian art, decorative arts and period American furnishings.